Japanese propaganda map issued shorlty after takeover of Taiwan on unusual projection. 山陽新報 附錄 / Sanyo Shimbun Supplement. 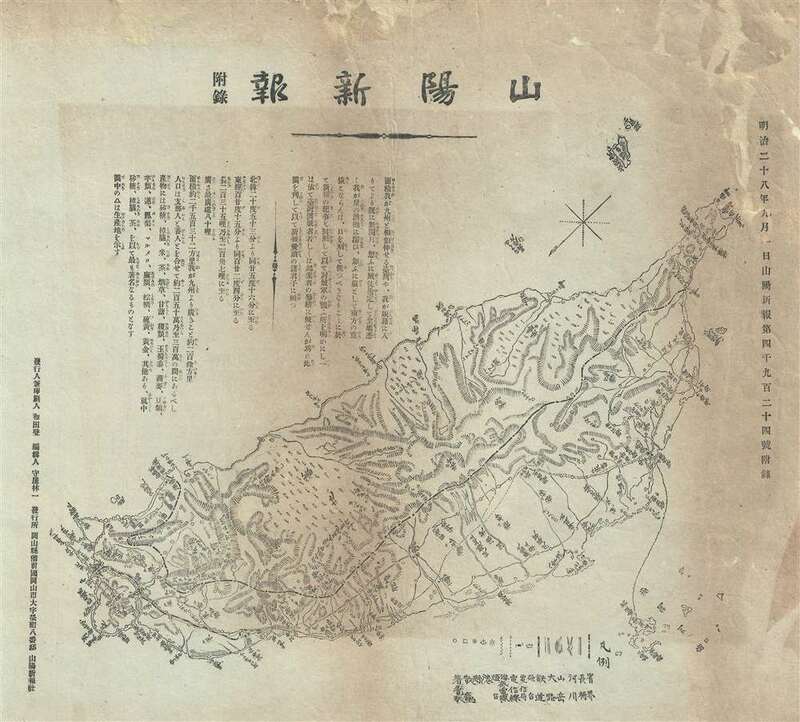 This is a rare and unusual propaganda map of Taiwan or Formosa, issued in September of 1895 (Meiji 28), a few months after the Japanese takeover. The map covers all of Taiwan and the nearby Penghu or Pescadores Islands. It is presented on an unusual southeasterly orientation, with north in the bottom left corner. A border roughly following the Zhongyang Range separates western or Chinese Taiwan from aboriginal Taiwan to the east. A key in the at the bottom identifies cities, railroads, roads, topography, and resources. The map was published as supplement to the Okayama newspaper, the Sanyo Shumbun (山陽新聞), on September 1 of 1895. We are aware of no other surviving examples. Sanyo Shimbun (山陽新聞, January 4, 1879 - Present) is a Japanese language daily newspaper published out of Okayama City, Japan. The company was founded in 1879 as the Sanyo Shinkansen. Kanaya Sakamoto (坂本金弥, 1865 - 1923), an important Japanese businessman and politician, launched the Chinese Private Press (中国民報) in 1892, which merged with the Sanyo Shinkansen in 1936. The newspaper remains active to this day. Good. Overall toning, acid transferrence, backed on Japanese tissue, repairs top margin.